Hendrik Luesch, Ph.D., a professor and chair of medicinal chemistry and the Debbie and Sylvia DeSantis Chair in Natural Products Drug Discovery and Development in the University of Florida College of Pharmacy, presented on the expanding chemical space for drug discovery at the 7th Kuwait International Pharmacy Conference. The biannual event was organized by the pharmacy faculty at Kuwait University and held March 5-7 in Kuwait City. 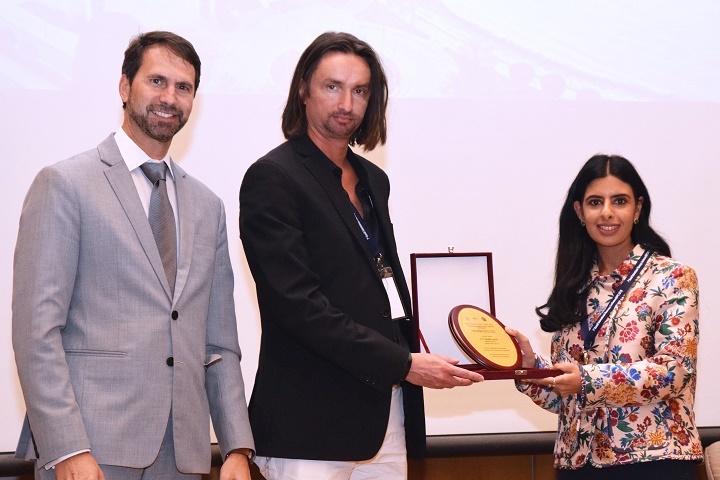 Pictured left to right are: Pierre Moreau, B.Pharma, Ph.D., dean of the Faculty of Pharmacy at University of Kuwait, Hendrik Luesch, Ph.D., professor and chair of medicinal chemistry at UF College of Pharmacy, and Fatma Al-Awadhi, B.Pharm., Ph.D., an assistant professor in the Faculty of Pharmacy at the University of Kuwait. The conference was titled: “Medicines – from discovery and delivery to optimal use” and covered a diversity of topics related to contemporary issues and developments from basic pharmaceutical sciences to real-life accomplishments and challenges in expanding the scope of pharmacy practice. More than 250 people attended the three-day event and it featured 40 speakers from universities in Canada, North America, Europe and the Persian Gulf region. Fatma Al-Awadhi, B.Pharm., Ph.D., a 2017 graduate of the UF College of Pharmacy, served as the chairperson of the conference’s organizing committee. Al-Awadhi is an assistant professor in the department of pharmaceutical chemistry at Kuwait University. 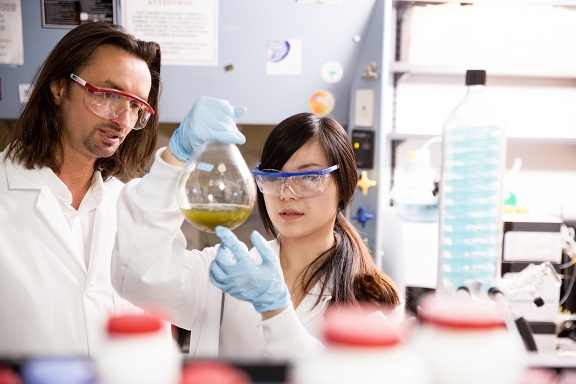 Bonnie Avery, Ph.D., a clinical professor of pharmaceutics, and Chris McCurdy, Ph.D., a professor of medicinal chemistry, hold up a flask of kratom, or Mitragyna speciosa, in a laboratory at the University of Florida. Researchers at the UF College of Pharmacy research kratom’s potential to wean addicts off opioids. The National Institute on Drug Abuse has awarded researchers at the University of Florida College of Pharmacy a two-year, $3.5 million grant to bolster research on Mitragyna speciosa, or kratom, and its potential to treat opioid misuse and physical dependence. 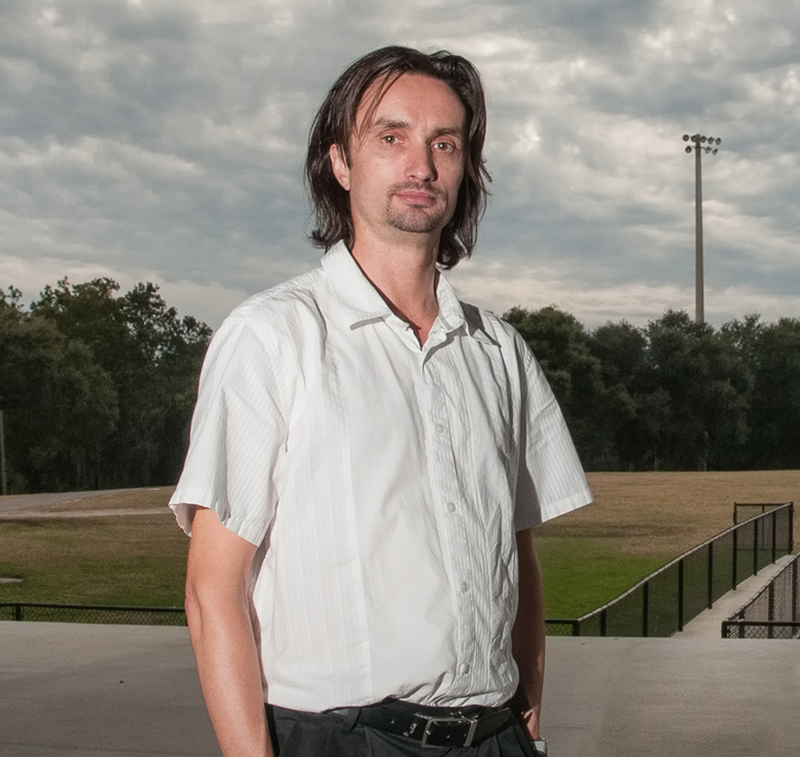 Rob Huigens, Ph.D., an assistant professor of medicinal chemistry in the UF College of Pharmacy, and his research team have developed a novel compound that uniquely starves biofilms of iron. Assistant professors Rob Huigens, Ph.D. and Yousong Ding, Ph.D., each secured $1.7 million grants from the National Institute of General Medical Sciences in August. For these junior faculty hired in 2013, earning a National Institutes of Health grant is a first. For the department of medicinal chemistry in the University of Florida College of Pharmacy, the new grants achieve department perfection, with 10 out of 10 tenure-track Ph.D. program faculty members being federally funded. 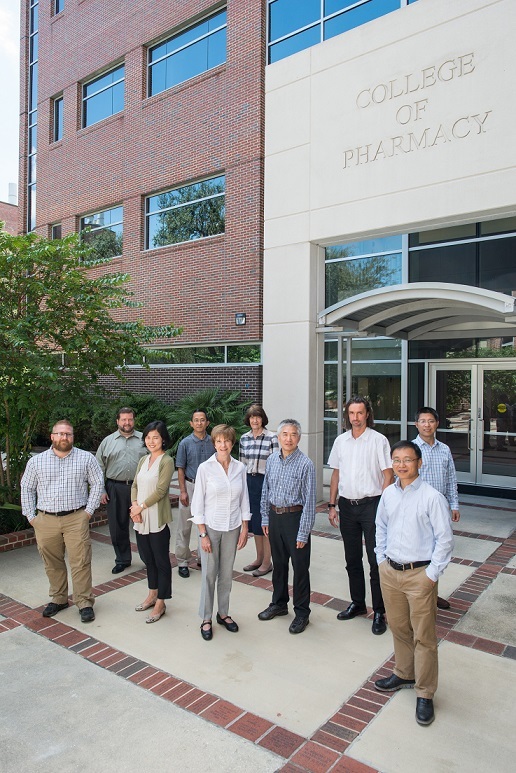 All 10 department of medicinal chemistry faculty in the UF College of Pharmacy are funded on federal grants. The 10 medicinal chemistry faculty currently serve as principal investigators on 18 different federally funded grants worth more than $18.4 million. Their research projects span broad interest areas from identifying novel cancer drugs in the ocean to developing new compounds as potential therapies to combat drug abuse. The National Institutes of Health, or NIH, sponsors many of the grants. Since 2015, six new faculty joined the department, significantly contributing to the research funding growth. All but one of the hires joined at an associate professor rank or higher. Luesch credits the visionary recruitment of some of the most innovative young investigators in 2013 as critical to the Center for Natural Products, Drug Discovery and Development, or CNPD3, genomes-to-natural products-to-drugs initiative that flourished in the revitalized department. The successful recruitment of several accomplished medicinal chemists with complementary expertise and research interests in areas of high unmet clinical needs also elevated his department’s prestige and productivity. In addition to the 10 tenure-track faculty with federal grants, Ranjala Ratnayake, Ph.D., a non-tenure track research assistant professor, secured an NIH grant to develop complex natural product libraries and multidimensional anticancer screening platforms in the CNPD3. Hendrik Luesch, Ph.D., and Weijing Cai, Ph.D., authored a study in the journal Investigational New Drugs, which highlights the development of Apra S10 as a potential pancreatic cancer drug. The pancreas is surrounded by stromal cells that often act as a barrier preventing cancer drugs from targeting a tumor. These cells impair drug delivery and secrete substances that stimulate tumor growth. The protective barrier has frustrated cancer researchers trying to target pancreatic tumors with new drugs, since they do not effectively reach the cancer cells. “We have shown initially that our drug goes to the pancreas, which is rare,” said Hendrik Luesch, Ph.D., a professor and chair of medicinal chemistry and the Debbie and Sylvia DeSantis Chair in Natural Products Drug Discovery and Development in the UF College of Pharmacy. Apra S10 originates from a family of molecules known as apratoxins, found in select areas of the Pacific Ocean near Micronesia. Luesch discovered the original compound off the coast of Guam two decades ago and years of medicinal chemistry refinements have yielded several potential cancer therapies, including Apra S10. In recent years, UF researchers identified the compound’s mechanism of action and how it acts in stopping the growth of cancer cells. Apratoxin-derived molecules deliver a “one-two punch” by inhibiting the tumor cell’s receptors and the growth factors that act on them. The compound preferentially targets secretory organs by inhibiting pathways conducive to tumor growth. Since the primary role of the pancreas is to secrete hormones and digestive enzymes, Luesch said it made sense to target pancreatic cancer. UF researchers initially evaluated Apra S10 using established cancer cell lines grown in a laboratory and subsequently in primary patient-derived cancer cells, where the compound showed potent activity. Additionally, Luesch found that Apra S10 effectively inhibited the secretion of growth factors from stromal cells, thereby simultaneously targeting a mechanism of resistance. The compound was then tested in a novel animal model, called PDX. 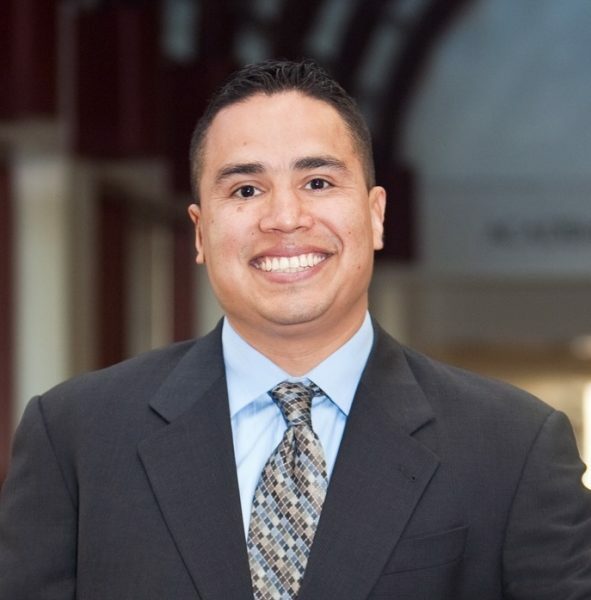 Jose Trevino, M.D., an assistant professor of surgery in the UF College of Medicine, and collaborator on the Apra S10 study. Researchers treated the mice with Apra S10, resulting in a decrease in tumor growth and a reduction in cellular proliferation in the tumor. The worldwide commercial rights to the apratoxin family of molecules are exclusively licensed to Oceanyx Pharmaceuticals Inc., a novel drug discovery and development company that leverages marine biology-based, natural-product research. Microbes are a prominent source of new therapeutically relevant compounds, but current discovery processes can only access a small fraction of these compounds. Ding seeks to develop new approaches for directly encoding chemicals from microbial genomes. In addition, enzymes as biocatalysts are proven alternatives for chemical synthesis, thus discovery of new enzymology from microbes can advance the synthesis of structural complex natural products, aiding drug research. 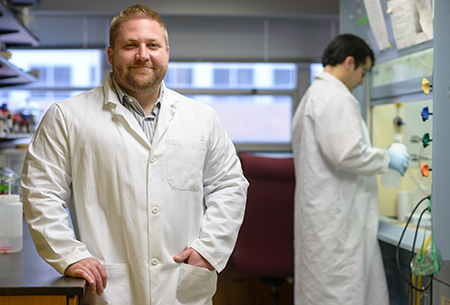 The National Institute of General Medical Sciences has awarded a five-year, $1.7 million grant to Rob Huigens, Ph.D., an assistant professor of medicinal chemistry, to support natural product-inspired drug discovery programs. Known as the Maximizing Investigators’ Research Award, the grant will fund several of Huigens’ research projects, including efforts to develop compounds that will eliminate bacterial biofilm-associated infections. Biofilm cells are largely resistant to conventional antibiotic treatments, and the Huigens lab has used chemical synthesis to discover and develop diverse biofilm-eradicating agents. His research team will also use RNA-sequencing technology to study biofilm viability and identify the cellular targets and pathways critical to biofilm survival. In addition, a separate drug discovery program led by Huigens aims to increase the chemical diversity of screening libraries by using available indole alkaloids for the synthesis of complex and diverse compound libraries. Researchers will screen small molecules synthesized in this program for biological activity relevant to various diseases, including drug addiction and diabetes. The American Cancer Society has awarded a four-year, nearly $800,000 grant to University of Florida College of Pharmacy researchers who are pursuing next-generation cancer therapeutics for patients. 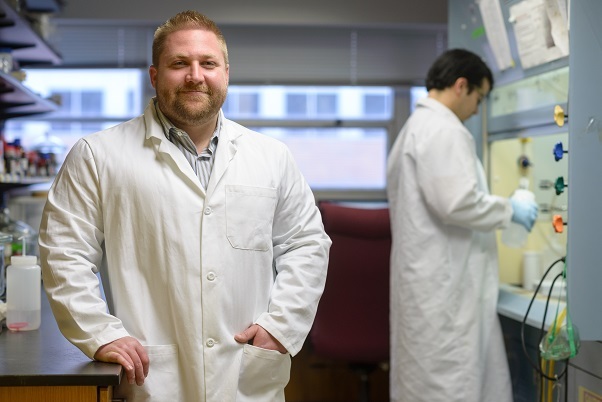 Led by principal investigator, Rob Huigens, Ph.D., an assistant professor of medicinal chemistry, the grant establishes a drug discovery pipeline to generate and identify new small molecules that possess anticancer activities. The pipeline begins with chemical synthesis efforts to alter the ring structure of alkaloids and produce large quantities of diverse compound libraries. Researchers then biologically screen the compounds against multiple cancer cell lines, including colorectal and breast cancer cells, to identify any anticancer activities. Promising compounds may continue down the pipeline into pre-clinical studies to determine in vivo efficacy in various tumor models. Other UF College of Pharmacy collaborators on the study include, Hendrik Luesch, Ph.D., a professor and chair of medicinal chemistry and the Debbie and Sylvia DeSantis Chair in Natural Products Drug Discovery and Development, and Ranjala Ratnayake, Ph.D., a research assistant professor of medicinal chemistry. Katherine Cisneros, a fifth-year graduate student in the department of medicinal chemistry, and Marissa Valentine King, a graduate student in the UF College of Veterinary Medicine, earned blue ribbon honors as one of the top posters at the Association for Clinical and Translational Science Meeting in Washington D.C. The duo’s poster titled, “A TL1 Team Approach to Evaluating Novel Antimicrobial Compounds against Mycoplasmas and their Interaction with Drug Metabolizing Enzymes,” ranked in the top 25 percent of all TL1 trainees presenting. The TL1 program gives predoctoral students an opportunity to gain skills associated with developing a career in multidisciplinary clinical and translational research. 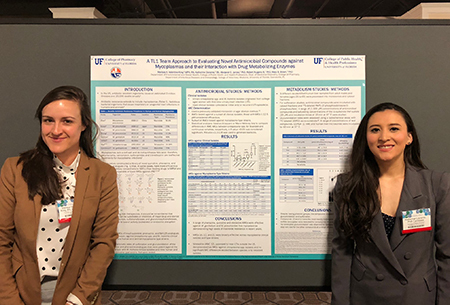 Marissa Valentine King (left) and Katherine Cisneros earned blue ribbon honors as one of the top posters at the Association for Clinical and Translational Science Meeting. Cisneros and King’s collaboration originated following a TL1 information session where they discovered a shared mutual research interest. 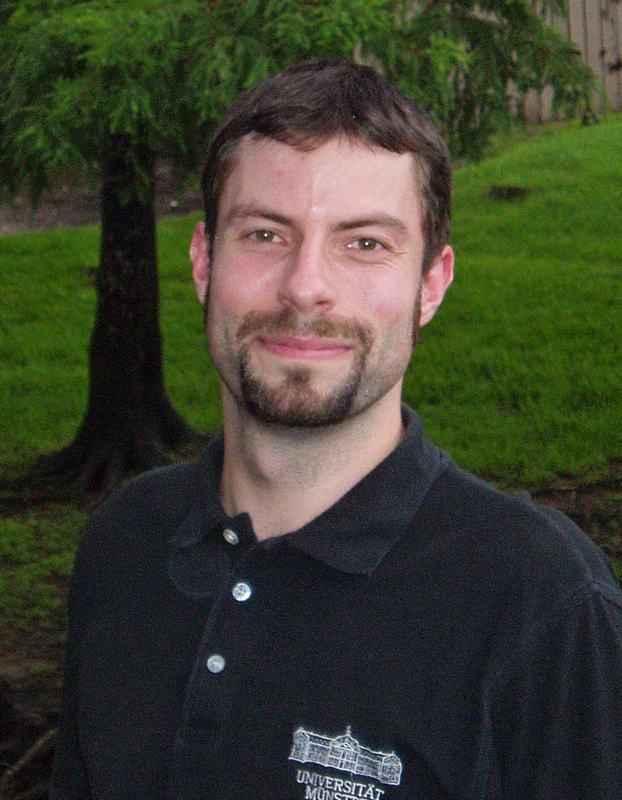 In their award-winning research, Valentine used clinical Ureaplasma species isolates and human and animal mycoplasma pathogens to evaluate the efficacy of newly synthesized antimicrobial compounds from the lab of UF College of Pharmacy Assistant Professor Rob Huigens, Ph.D. Cisneros then evaluated the effective compounds for evidence of potential endocrine disruption by evaluating their interaction with drug metabolizing enzymes. Margaret James, Ph.D., a professor of medicinal chemistry, serves as Cisneros’ mentor, while Mary Brown, Ph.D., a professor in the College of Veterinary Medicine, mentors King. With spring break only weeks away, many Americans will apply sunscreen to protect against the sun’s harmful ultraviolet radiation. Now, scientists at the University of Florida College of Pharmacy have identified a new method to harvest a key ingredient responsible for making the product more environmentally friendly. By pushing the discovery to commercialization, UF researchers hope to make ‘green’ sunscreens more available, reducing dependence on oxybenzone- and octinoxate-based sunscreens. These harmful chemicals accumulate in aquatic environments; they’re toxic to marine life and potentially disrupt the human reproductive system. The American Chemical Society’s peer-reviewed journal, ACS Synthetic Biology, published findings from Ding’s shinorine study this month. Other University of Florida researchers participating in the study included Guang Yang, Ph.D.; Monica Cozad; Destin Holland; Yi Zhang and Hendrik Luesch, Ph.D., a professor and chair of medicinal chemistry and the Debbie and Sylvia DeSantis Chair in Natural Products Drug Discovery and Development. The Coprinus comatus mushroom, commonly known as the lawyer’s wig or shaggy mane, killed human T-cell leukemia cells during laboratory tests, the researchers found. Its potency and ability to selectively target leukemia cells makes it a promising candidate for cancer treatment, researchers said. The group’s findings were published Aug. 7 in the Proceedings of the National Academy of Sciences. 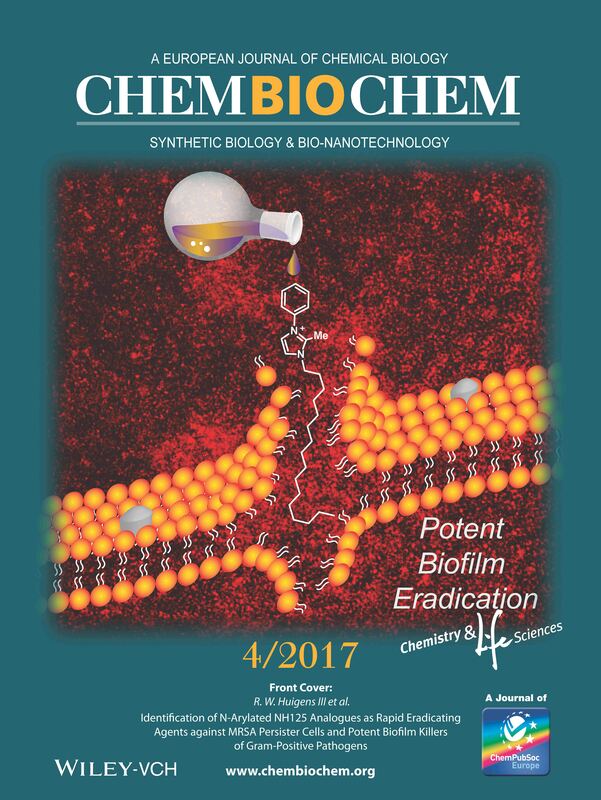 A University of Florida research team investigating biofilm-eradication has landed on the cover of the Feb. 16 issue of ChemBioChem, a peer-reviewed European journal of chemical biology. 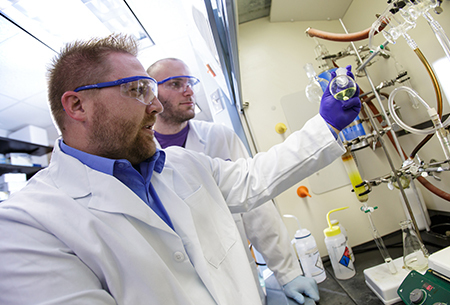 Led by Rob Huigens, Ph.D., an assistant professor of medicinal chemistry, the research team discovered new compounds that rapidly eradicate persistent bacteria and biofilms. The compounds could be used as next-generation disinfectants to eradicate biofilms in hospital settings, which lead to drug resistant infections. UF researchers tested the compounds against other compounds known to target and breakdown bacterial membranes and found them to be more potent at killing biofilms and active in rapidly killing persistent bacterial cultures head-to-head with the other membrane-targeting compounds. Assisting Huigens with the research were UF graduate students Yasmeen Abouelhassan and Akash Basak and researcher Hussain Yousaf. A record 89 poster entries and a keynote address about how technology is transforming clinical drug development highlighted the College of Pharmacy’s 30th Annual Research Showcase event on Feb. 17. 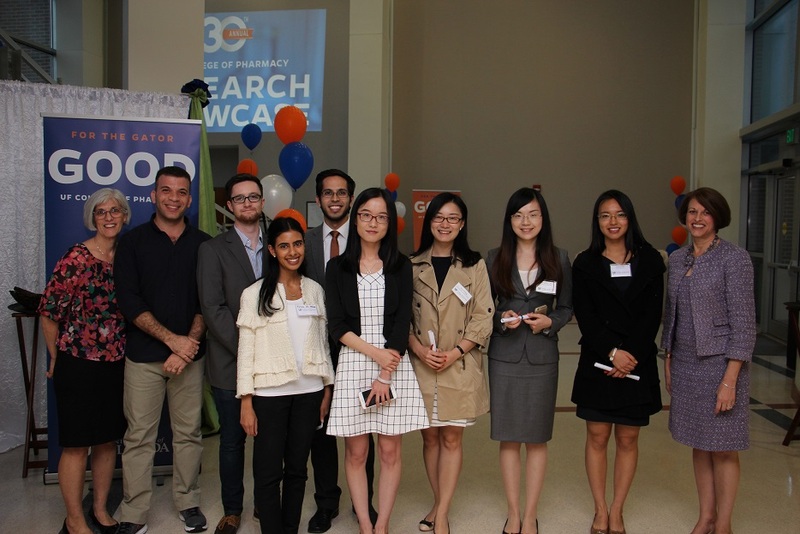 The day of excitement and discovery offered an opportunity for professional pharmacy students, graduate students and postdoctoral fellows to share research findings and compete for awards in either oral or poster competitions. For second-year Pharm.D. 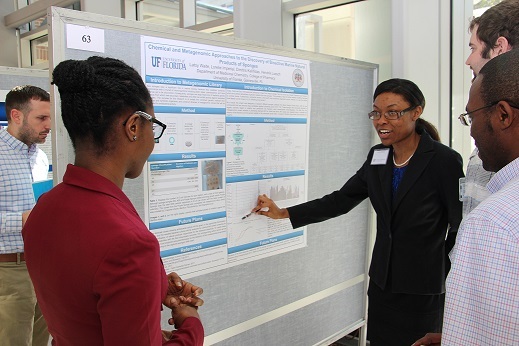 student Latoy Waite, Research Showcase presented the first opportunity for her to compete in a research poster competition. Waite studies in the research lab of Hendrik Luesch, Ph.D., professor and chair of medicinal chemistry and the Debbie and Sylvia DeSantis Chair in Natural Products Drug Discovery and Development. Her research poster featured two different drug discovery approaches involving sponges from a marine environment, with the idea of testing the sponges to explore if they have bioactivity against cancer cells and persistent bacteria. Johannes Kast presents his poster on how medications work in space. 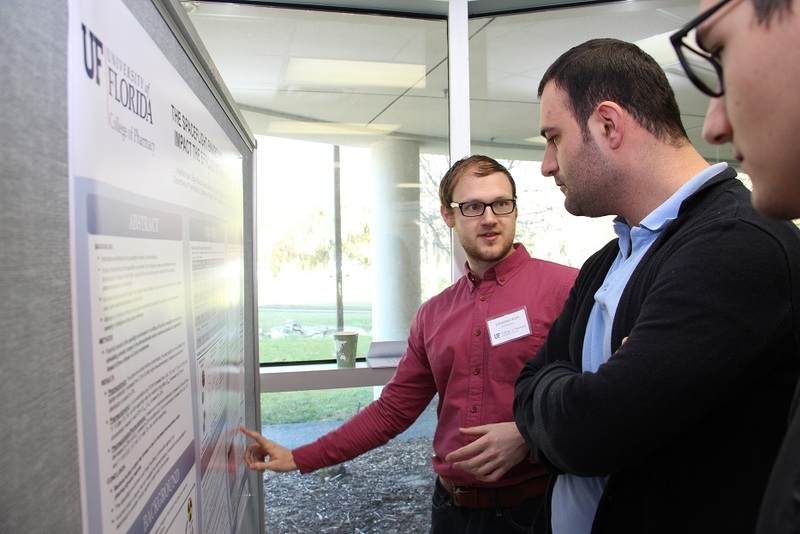 Johannes Kast, a fifth-year Ph.D. student in the department of pharmaceutics, competed in his fourth Research Showcase this year. His poster examined how medications work in space—specifically how the efficacy of amoxicillin could be impaired during space missions. Through modeling and simulation, he found that the bacterial burden in space may be higher due to increased antibiotic resistance and deceased amoxicillin concentrations in the body. Kast has regularly competed in Research Showcase because it makes him a better scientist. Edmundo Muniz, M.D., Ph.D., CEO of Certara, a company offering technology and consulting services for optimizing drug development and improving health outcomes, offered insight into the intersection of technology and biology in his keynote remarks. He defined a paradigm shift underway in biology, including drug discovery, development and use, where technology is radically transforming the process of knowledge generation and decision-making. Dr. Edmundo Muniz, CEO of Certara, delivered the keynote address. Muniz predicted that technology will reduce the role of humans in clinical trials. Furthermore, “one size fits all” drug development will give way to personalized medicine and individualized care. He also told the audience that translational science will be required to show not just efficacy and safety, but meaningful value to the healthcare system. He added that pharmaceutical drug development will shift from a predominantly biological scientific focus to a hybrid with a strong focus on technology. Adding to the significance of this year’s event was the 30th anniversary milestone. 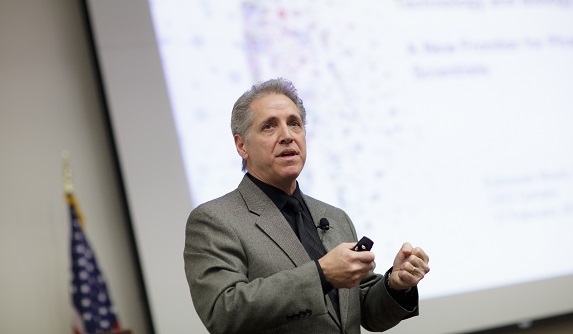 The Annual Research Showcase began under the leadership of former UF College of Pharmacy Dean Michael Schwartz, Ph.D., who saw the event as an opportunity to bring greater visibility to the college’s research efforts and promote collaboration among departments. A video from College of Pharmacy alumni who had participated in previous Research Showcase events was shown to commemorate the milestone year. Finalists and winners of the oral competition. Association of Chronic Hepatitis C Virus Infection and the Risk of Cardiovascular Disease in the U.S.
Hendrik Luesch, Ph.D., a professor and chair of medicinal chemistry and the Debbie and Sylvia DeSantis Chair in Natural Products Drug Discovery and Development, received the Golden Medal Award for his presentation at the 2nd International Conference on Herbal and Traditional Medicine. 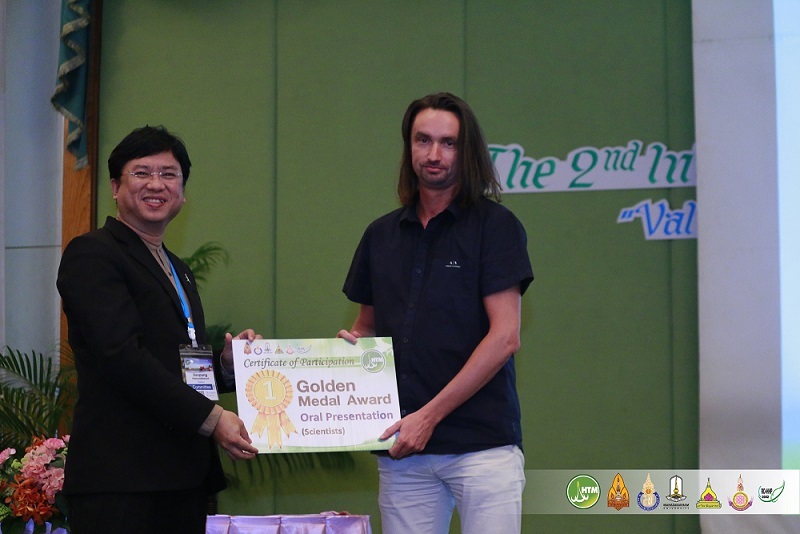 Luesch’s presentation titled, “Marine Biodiversity as a Starting Point for Drug Discovery and Development,” secured the best presentation award by highlighting his research in the biodiverse landscape of the world’s oceans in search of the next promising drug discovery. Hosted by the Faculty of Pharmaceutical Sciences at Khon Kaen University, the conference was held Jan. 25-27 in Bangkok, Thailand, and attracted researchers from around the world that are contributing to the discovery of natural products from natural sources. Hendrik Luesch, Ph.D., Nick Paciaroni, and Rob Huigens, Ph.D., led the ring distortion research at the College of Pharmacy. A novel strategy developed by UF Health researchers has yielded several promising compounds to fight inflammation and diseases such as colorectal cancer. The novel ring distortion approach generate compounds that complement existing screening libraries that house many structurally simple compounds used to discover new drug therapies. By introducing dozens of complex small molecules developed from yohimbine, a drug which contains a complex ring system, and related natural products, researchers at the University of Florida College of Pharmacy will add to the arsenal of compounds available to drugmakers today. The makeup of screening libraries largely dictates the level of success for drugmakers in finding viable drugs to treat various diseases. Huigens said simple organic molecules fill the libraries today because they are easy to synthesize and produce in large numbers, but the absence of complex molecules has limited the discovery of new drug therapies. Huigens’ ring distortion strategy uses basic chemistry of the two rings found in yohimbine and other complex natural products, which enabled the rapid synthesis of 70 complex compounds by dramatically altering the complex ring system. UF researchers used chemical reactions to generate different molecular architectures, which are then screened for effectiveness in diverse disease areas such as cancer and inflammation. The screenings identified six biologically active compounds, including an anticancer compound that demonstrated an ability to suppress HIF transcription factors, a protein often linked to cancer growth. The six promising compounds identified are being developed to enhance the potency of the compounds and test for properties such as stability and toxicity. Successful preclinical trials with optimized compounds could pave the way for future clinical trials. In addition, this unique chemical library is being screened through collaboration with additional experts to drive discoveries in other disease areas. Ring distortion strategy offers the potential for the discovery of many more biologically active small molecules that could address multiple disease areas. The new approach positions natural products as the starting point for the drug discovery process by teasing out novel molecular architectures that will then be screened. Huigens said the strategy challenges the traditional mindset of chemists who are reluctant to explore complex molecules because they are challenging to synthesize, since this strategy relies on rapid and diverse chemical syntheses pathways limited only by a chemist’s creativity. “We want people to adopt a discovery mindset where they look at a complex natural product and say, ‘I want to be able to complement our simple compound library with complex structures,’” Huigens said. Rob Huigens, Ph.D., an assistant professor of medicinal chemistry, has been selected as the 2016-17 University of Florida College of Pharmacy Teacher of the Year. The honor is the highest recognition of teaching excellence given within the College of Pharmacy. Passionate as a researcher and educator, Huigens brings an enthusiasm and energy to the classroom. He is well recognized for his engaging approach that stimulates student interest in medicinal chemistry. His teaching involves spiraling student’s prior knowledge about basic organic chemistry with essential medicinal chemistry concepts. 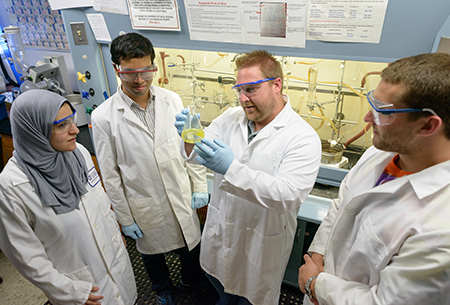 By collaborating with his teaching partners, Huigens has integrated medicinal chemistry concepts into the interdisciplinary case studies that are used during second-year patient care courses. Huigens joined the College of Pharmacy in 2013. He earned a Bachelor of Arts from the University of North Carolina at Greensboro and a Ph.D. in chemistry from North Carolina State University. He served as an American Cancer Society postdoctoral fellow at the University of Illinois at Urbana-Champaign prior to joining the UF College of Pharmacy. His research interests include organic synthesis, drug discovery, medicinal chemistry, chemical biology, antibacterial agents and personalized cancer therapeutics. As the 2016-17 Teacher of the Year, Huigens will represent the College of Pharmacy at University of Florida Teacher of the Year events and the American Association of Colleges of Pharmacy Annual Meeting in Nashville, Tennessee. The UF Health Science Center honored 27 newly endowed professors during its fifth annual Celebrating Distinction Ceremony. Pictured from the College of Pharmacy are, l to r, Drs. Chenglong Li, Almut Winterstein and Chengguo “Chris” Xing. The honors were made possible thanks to the generosity of donors who chose to invest in College of Pharmacy faculty and their programs. Nicholas and Sheryl Bodor established the Nicholas Bodor Professorship in Drug Discovery in 2007, and the couple attended the Celebrating Distinction ceremony to welcome Chenglong Li into his new professorship position. In addition to the three College of Pharmacy professors honored, UF Health recognized 24 recently endowed professors and chairs from UF’s other academic health colleges at the Celebration Distinction ceremony. Established in 2007 by Nicholas and Sheryl Bodor, this fund supports a professorship in drug discovery at the UF College of Pharmacy. Bodor joined UF in 1979 as professor and chair of the department of medicinal chemistry and was promoted to graduate research professor of the university in 1983. Bodor founded the Center for Drug Discovery in 1986 and supervised the training of 50 doctoral students and more than 100 postdoctoral-level research associates and fellows. 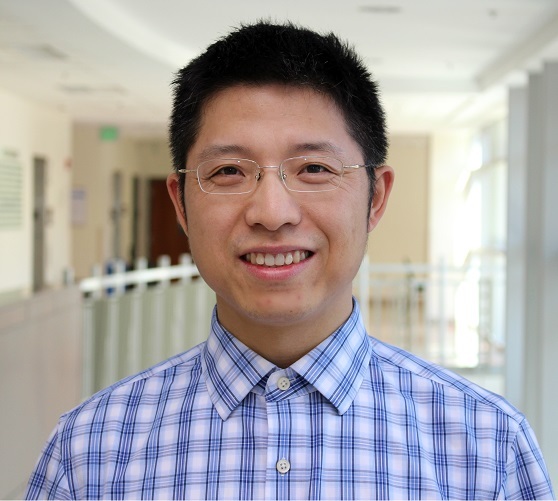 Medicinal chemist Chenglong Li, Ph.D., joined the UF College of Pharmacy in 2016 and serves as the graduate coordinator in the department of medicinal chemistry. 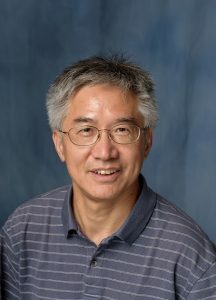 With wide-ranging interests in chemistry, Li focuses his research on molecular recognition, with a strong application to structure-based, computer-aided drug design. He uses computational and experimental approaches to explore the connection among molecular structure, dynamics and function. Prior to joining UF, Li was a professor at The Ohio State University College of Pharmacy for 11 years. He also worked as a research associate in computational chemistry at The Scripps Research Institute in La Jolla, California. He received a doctoral degree in biophysics and a minor in organic chemistry from Cornell University in 2000 and earned his master’s and bachelor’s degrees from Beijing University in China. What kind and how much medication a patient receives can be a matter of life or death. That’s why Robert Crisafi, Ph.D., who received his doctoral degree in pharmacy from UF in 1956, spent a career focused on patient safety and the role pharmacists can play in reducing medical errors in hospitals. The Crisafi Chair in Pharmaceutical Outcomes and Policy was established with the goal to create systems that will prevent medication errors. 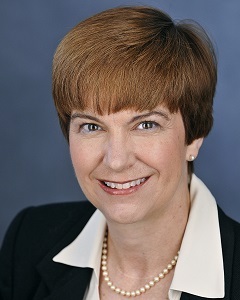 The chair works in conjunction with UF Health to generate new studies and processes to further reduce drug errors at hospitals throughout the U.S.
Almut Winterstein, Ph.D., a professor and chair of the department of pharmaceutical outcomes and policy at the UF College of Pharmacy, is recognized as an international leader in drug safety and pharmacoepidemiology. She has focused her research on evaluating drug safety and effectiveness in real-world populations and on devising ways to improve medication use. Since joining the UF College of Pharmacy in 2000, Winterstein has collaborated with UF Health’s teaching hospitals on studies aimed at evaluating and improving patient safety and drug therapy outcomes. She has received funding from various federal agencies and serves as chair of the Food and Drug Administration’s Drug Safety and Risk Management Advisory Committee. In 2013, Winterstein was inducted as a fellow of the International Society of Pharmacoepidemiology. She graduated with her pharmacy degree from Friedrich Wilhelm University in Bonn, Germany, and received her doctoral degree in pharmacoepidemiology and social pharmacy from Charité, Humboldt University in Berlin. Frank A. Duckworth established the first endowed eminent scholar chair in the UF College of Pharmacy in 1989. Duckworth received a degree in pharmacy in 1942 and a juris doctor in 1948, both from UF. He taught in the UF College of Pharmacy and was awarded the college’s first Distinguished Alumnus Award in 1986. He was also instrumental in providing the vision and inspiration for the creation of Oak Hammock at the University of Florida. Duckworth passed away in 2002. Accomplished researcher Chengguo “Chris” Xing is a professor of medicinal chemistry at the UF College of Pharmacy. He joined the college following 13 years at the University of Minnesota. His research is funded by the National Institutes of Health and broadly covers the isolation, design and synthesis, and identification of biologically active small molecules to help manage diseases and understand biology. His research is focused on translational development with several indications, including novel therapies selective against multidrug resistant malignancies, chemopreventive agents against primary carcinogenesis, and a natural dietary supplement on neurological disorders, with the goal to extend them in the clinical setting. Xing received his doctoral degree from Arizona State University and completed postdoctoral training at Harvard University. The University of Florida College of Pharmacy welcomed five new faculty to the college in July and August. Included in the group are UF Preeminence scholars, Chengguo (Chris) Xing, Ph.D., and Chenglong Li, Ph.D. The new faculty additions bring the total number of new faculty hires in the college to 28 since summer 2013. 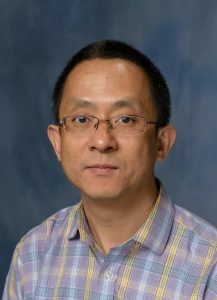 Accomplished researcher Chengguo (Chris) Xing, Ph.D., has been appointed a professor of medicinal chemistry and the Frank A. Duckworth Eminent Scholar Chair in Drug Research and Development at the University of Florida College of Pharmacy. Xing joined the college in August following 13 years at the University of Minnesota. His research is funded by the National Institutes of Health and broadly covers the isolation, design and synthesis and identification of biologically active small molecules to help manage diseases and understand biology. As the Frank A. Duckworth Eminent Scholar Chair, his research at UF will focus on translational development with several indications, including novel therapies selective against multi-drug resistant malignancies, chemopreventive agents against primary carcinogenesis, and a natural dietary supplement on neurological disorders with the goal to extend them in the clinical setting. Xing obtained his Ph.D. degree from Arizona State University and completed postdoctoral training at Harvard University. Medicinal chemist Chenglong Li, Ph.D., joined the University of Florida College of Pharmacy in August as the Nicholas Bodor Professor in Drug Discovery. He will also serve as the graduate coordinator in the department of medicinal chemistry. With wide ranging interests in chemistry, Li focuses his research on molecular recognition, with a strong application to structure-based computer-aided drug design. He uses computational and experimental approaches to explore the connection among molecular structure, dynamics and function. Prior to joining UF, Li was a professor at The Ohio State University College of Pharmacy for 11 years. He also worked as a research associate in computational chemistry at The Scripps Research Institute in La Jolla, California. He graduated with a Ph.D. in biophysics and a minor in organic chemistry from Cornell University in 2000, and earned his masters and bachelor’s degrees from Beijing University in China. 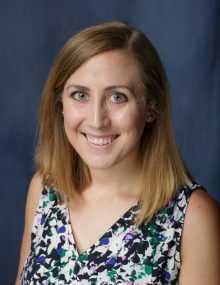 Bethany Shoulders, Pharm.D., has joined the College of Pharmacy as a clinical assistant professor in the department of pharmacotherapy and translational research. She maintains a clinical practice site at the trauma ICU at UF Health Shands Hospital. A graduate of the University of Tennessee Health Science Center in 2014, she completed a pharmacy practice residency at The Johns Hopkins Hospital in Baltimore and a PGY2 critical care pharmacy practice residency with the University of Pittsburgh Medical Center. Her research endeavors during residency included evaluating intraoperative continuous infusion cefazolin in a cardiac surgery population and characterizing the guideline evidence behind off-label medication use in the intensive care unit. 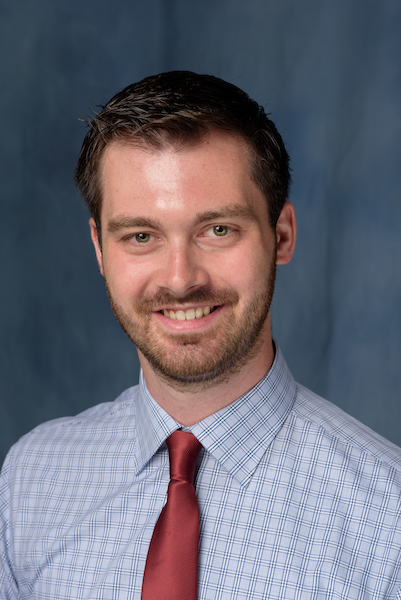 The University of Florida College of Pharmacy welcomed Christopher Campbell, Pharm.D., as a clinical assistant professor in the department of pharmacotherapy and translational research in August. He joined the college following completion of a PGY1 pharmacy residency and a PGY2 pediatric pharmacy residency at Georgia Regents Medical Center and the University of Georgia College of Pharmacy in Augusta, Ga. A native of Long Island, N.Y., he received his Doctor of Pharmacy degree from Northeastern University in 2014. Campbell will maintain a clinical practice site at UF Health Shands Hospital in the pediatric intensive care unit and the pediatric cardiac intensive care unit. A member of the American Society of Health-System Pharmacists and the Pediatric Pharmacy Advocacy Group, he has presented at state and national meetings and currently serves on the University HealthSystem Consortium Pediatric Pharmacy Committee. His research interests include pediatric critical care, anticoagulation and patient safety. One of the newest members of the College of Pharmacy faculty is a familiar face to the University of Florida Medication Therapy Management Communication and Care Center, or UF MTMCCC, in Lake Nona. Michelle Zeigler, Pharm.D., Ph.D., joined the department of pharmacotherapy and translational research as a clinical assistant professor in July. 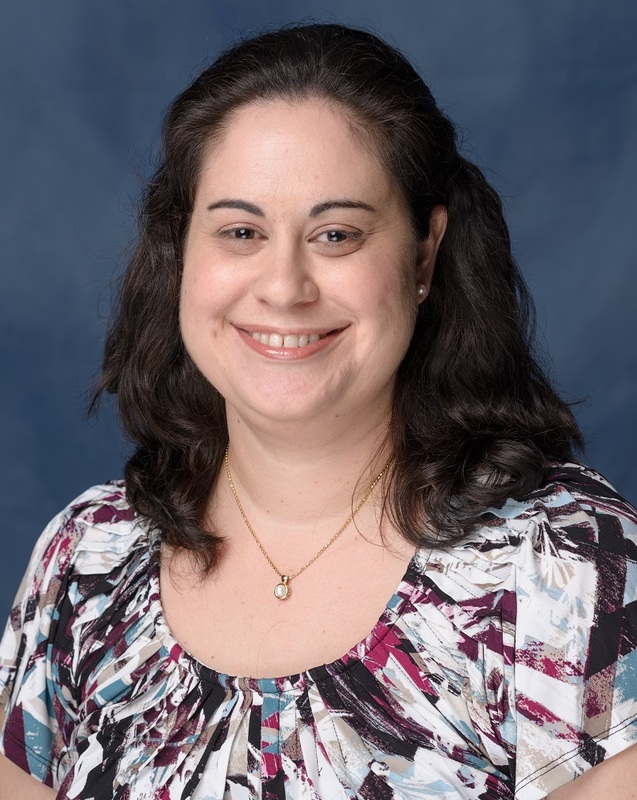 She previously served as a clinical pharmacist on the UF MTMCCC team since the campus opened in August 2012, and she will continue to work with UF MTMCCC in her new faculty role. Her clinical interests include health care communication, motivational interviewing and quality measures. Zeigler is a 2011 graduate of the UF College of Pharmacy. 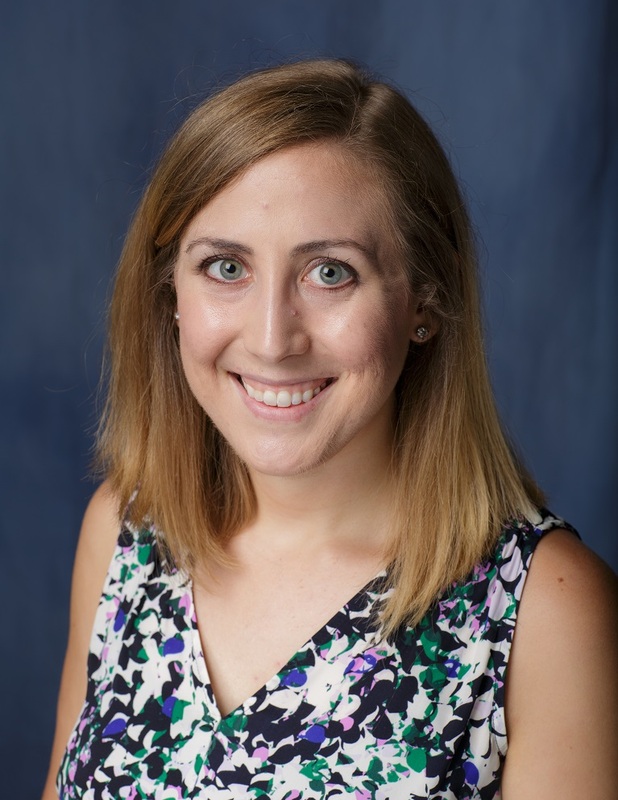 She completed a PGY-1 pharmacy residency at the Sarasota VA Community-Based Outpatient Clinic with a focus on ambulatory care in areas such as anticoagulation, diabetes, hypertension and hyperlipidemia. As a clinical pharmacist at UF MTMCCC, she worked on various prescriber outreach projects in addition to completing comprehensive medication reviews and providing adherence services. She also precepts third- and fourth-year pharmacy students. Prior to her pharmacy career, she earned a Ph.D. in plant molecular and cellular biology at UF. Just as a piano tuner adjusts the tension of the strings for optimal sound, medicinal chemists at the University of Florida College of Pharmacy are fine-tuning the structural positions of chemical compounds to find the most promising drug options for killing dangerous bacterial biofilms. An estimated 17 million Americans are affected by biofilm-associated bacterial infections annually. The biofilm-growing cells are largely resistant to conventional antibiotic treatments and can linger for months or even years. UF scientists recently discovered that a series of organic compounds called halogenated quinolines, or HQs, can kill dangerous bacterial biofilms present in recurring and chronic bacterial infections such as methicillin-resistant Staphylococcus aureus, or MRSA. In addition, researchers identified a way for chemists to better control the structural elements of HQ compounds which improves the likelihood of developing them into biofilm-attacking drug molecules. Chemists synthesize structural representations of molecular frameworks as models to study different chemical groups at different positions in a compound. The representations include a core group of atoms and numbered positions that can be manipulated to develop and test new compounds. Huigens’ team discovered that small changes at a location called the 2-position on the quinoline structure can dramatically impact the potency and ability of HQ compounds to destroy bacterial biofilms. UF researchers chemically synthesized 39 HQ compounds with different chemical groups and properties at the 2-position. The compounds were tested in multiple rounds of synthesis and biologically evaluated to determine and better develop their biofilm-eradication potential. The results yielded at least two molecules that were highly potent and warrant more testing. Equally as important as the discovery of new potent compounds is the newfound control that chemists now have in manipulating future HQ development. Now that researchers know how to structurally position atoms to develop highly potent HQ compounds, the next step is to use the information and incorporate critical aspects for drug properties, such as water solubility. Many organic chemicals are not highly water-soluble, so chemists must walk a fine line in improving water solubility while maintaining drug activity. An effective drug molecule will circulate in the body and distribute everywhere bacterial infections are located, a property that will be examined in a future study of these HQ compounds. 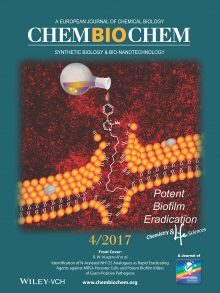 As researchers continue to fine-tune the chemistry involved in developing biofilm-eradicating drugs, each new discovery becomes the starting point for testing more advanced compounds, with the goal of one day eliminating biofilm-associated infections. 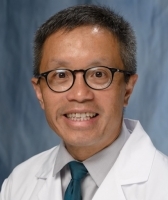 University of Florida pharmacy researchers have identified novel drug targets and a new screening method for drugs affecting the signaling pathways in colorectal cancer. Colorectal cancer is the fourth most common cancer in the United States. Every year, about 140,000 Americans are diagnosed and more than 50,000 people die from the disease. In 2000, President Bill Clinton officially designated March as National Colorectal Cancer Awareness month to draw attention to the deadly disease. Hendrik Luesch, Ph.D., a professor and chair of the department of medicinal chemistry and the Debbie and Sylvia DeSantis Chair in Natural Products Drug Discovery and Development, and Long H. Dang, M.D., Ph.D., an associate professor of medicine, have devised a strategy whereby multiple cancer pathways may be targeted simultaneously for drug discovery. Many of the proteins currently under investigation as possible targets for cancer therapy are found in these pathways. Their results appear in a study published in the American Chemical Society’s Chemical Biology journal. A signaling pathway is a group of molecules that activate each other when they need to pass along a message. In normal cells, a signaling pathway controls healthy cell growth and division, but in cancer cells, genetic mutations cause defects in the pathways. Scientists are trying to interrupt these problematic pathways in order to develop drugs to combat cancer. The research may be applied to other cancer therapies in the future, including colorectal, pancreatic, thyroid and lung cancers. “We could adapt this type of strategy for any cancer causing mutation, as it is a screening platform that could be extended to any gene that is a problem,” Luesch said. Using colorectal cell lines developed by Dang, UF Health researchers studied the relationship between two crucial signaling pathways involving KRAS genes and HIF transcription factors. Mutations of the KRAS genes are present in one-third to one-half of all colorectal cancers. HIF transcription factors are proteins often linked to cancer growth. Dang generated novel colorectal cell lines called knockout cells that were depleted of either mutated KRAS or HIF proteins. Luesch screened the knockout cells against parent cells that contained mutated KRAS and HIF proteins to identify drug targets that inhibited both signaling pathways. Almost 8,000 genes in the human genome were screened to identify novel drug targets in the pathways. Scientists then exposed the cells to more than 4,700 commercially available chemical compounds and identified 55 compounds that affect cancer cell growth in both the KRAS and HIF pathways. 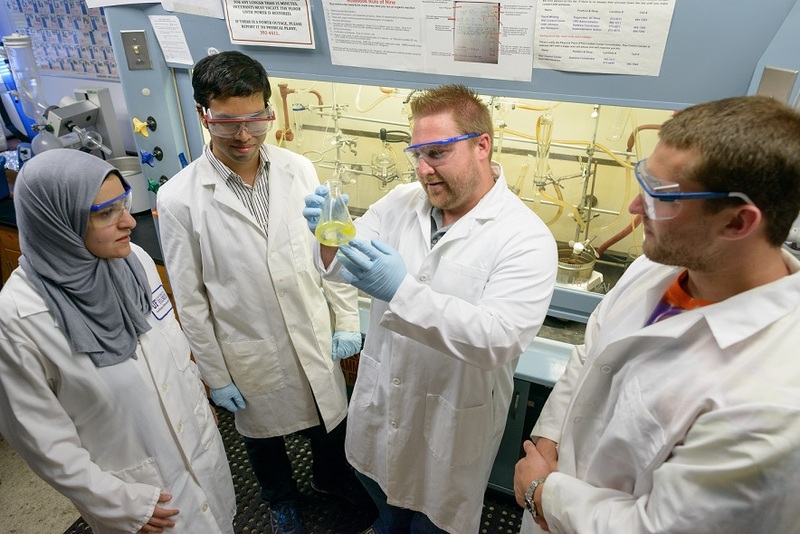 Next, Luesch’s team screened a subset of marine natural product compounds from a library housed at the UF Center for Natural Products, Drug Discovery and Development. These compounds were previously isolated in his lab from cyanobacteria, a rich source of bioactive molecules found in marine environments. UF scientists found two of the library’s compounds, dolastatin 10 and largazole, to be novel inhibitors of the KRAS and HIF pathways. Dolastatin 10 is a close relative of a new medicine used for the treatment of Hodgkin’s lymphoma and anaplastic large cell lymphoma, a rare type of non-Hodgkin’s lymphoma. 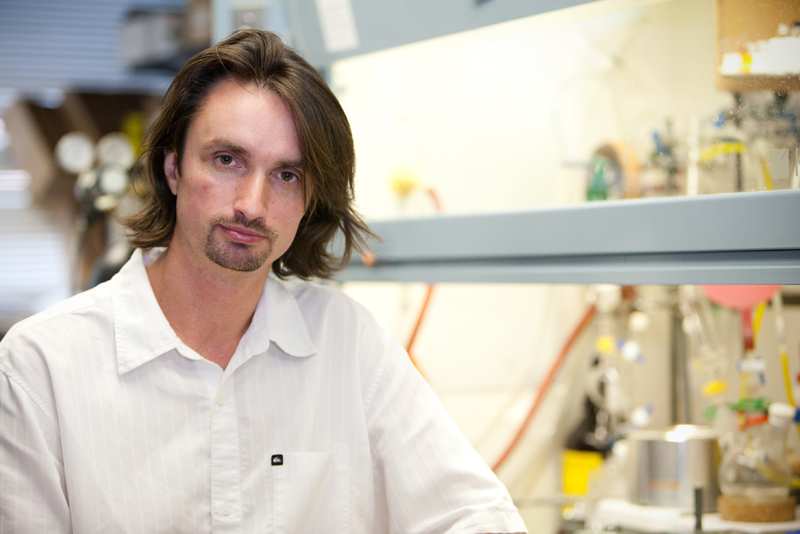 Luesch’s lab team identified the compound in the Pacific and Atlantic oceans. Largazole was discovered in cyanobacteria collected by Luesch’s team off the coast of the Florida Keys, and it has shown characteristics of being highly effective at reprogramming cancer cells and inhibiting cancer growth. Luesch sees this research as a starting point to screen for personalized therapies. The college’s Center for Pharmacogenomics studies how genes affect the way the body responds to medicines and identifies optimal drug therapies based upon genotype. 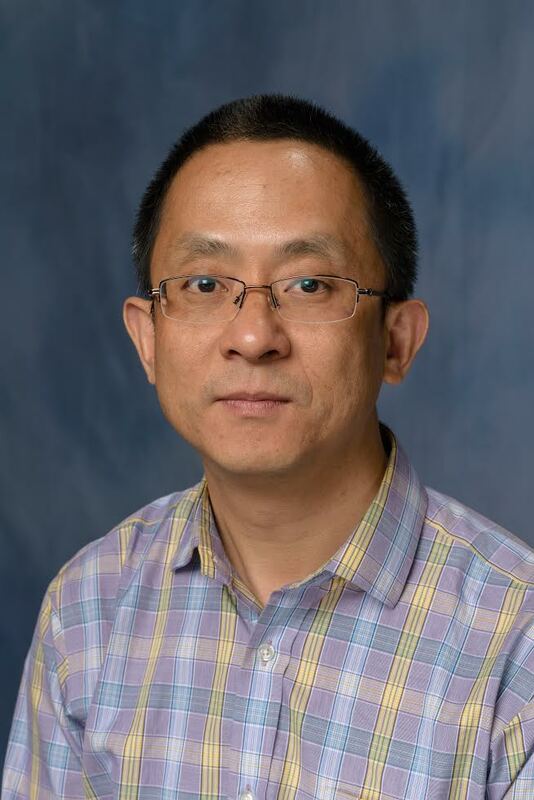 Yousong Ding, Ph.D., an assistant professor of medicinal chemistry, was one of 56 scientists and engineers selected to receive a grant award from the Air Force Office of Scientific Research, or AFOSR. The three-year award amounts to $360,000 and will allow Ding to develop an unprecedented cell-based strategy for the manufacturing of nitroaromatics, an important family of industrial chemicals that have a broad range of public and military uses. Industrial nitration is notorious for its heavily polluting processes, and Ding’s research will have the potential to revolutionize the nitration chemical industry by facilitating earth-benign production of nitroaromatics. AFOSR awarded approximately $20.6 million in grants to researchers at 41 institutions and small businesses who submitted winning research proposals through the Air Force’s Young Investigator Research Program. The competition is open to scientists and engineers at research institutions across the United States who received a Ph.D. or equivalent degree in the last five years and show exceptional ability and promise for conducting basic research. 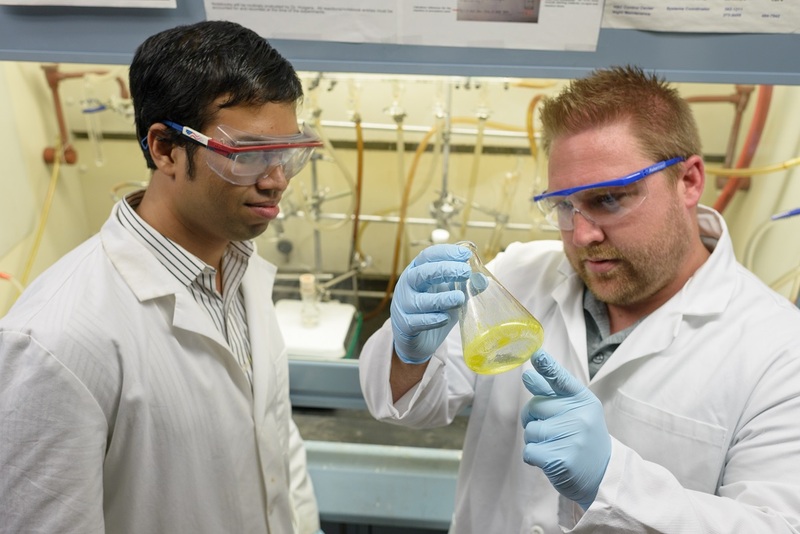 College of Pharmacy researchers have developed potent new compounds with aquatic origins that may offer relief for the 17 million American affected by biofilm-associated bacterial infections annually. Jane Aldrich, Ph.D., a professor of medicinal chemistry, has accepted an invitation to serve on the Drug Discovery for the Nervous System Study Section of the Center for Scientific Review. Members are selected based upon their demonstrated competence and achievement in their scientific discipline. In the role, Aldrich will review grant applications submitted to the National Institutes of Health, make recommendations on these applications to the appropriate NIH advisory council or board, and survey the status of research in her field of science. Hendrik Luesch, Ph.D., the Debbie and Sylvia DeSantis Chair in Natural Products Drug Discovery and Development in the UF College of Pharmacy, was one of two faculty named as the UF Foundation 2014 Preeminence Term Professors. Now in its second year, the University of Florida Foundation’s Preeminence Term Professorship program supports UF’s Preeminence goals. Each fall, the Foundation awards two $25,000 term professorships to faculty members with substantial research programs and outstanding records of accomplishment. Term professorships reflect UF’s commitment to invest in faculty members whose work is transforming lives. The awards enable recipients to extend their work through additional funding. Faculty members who receive the Preeminence Term Professorships are chosen from UF’s top faculty members, nominated by their deans. Director of the Center for Natural Products, Drug Discovery and Development (CNPD3), Luesch’s research focus is on unique marine natural products to fully exploit the biosynthetic and therapeutic potential of untapped biodiversity for drug discovery. His multidisciplinary research program, at the interface of chemistry and biology, combines classical natural products chemistry with high-throughput screening, chemical genomics and medicinal chemistry to identify, characterize and optimize novel drug candidates for various diseases, especially cancer. 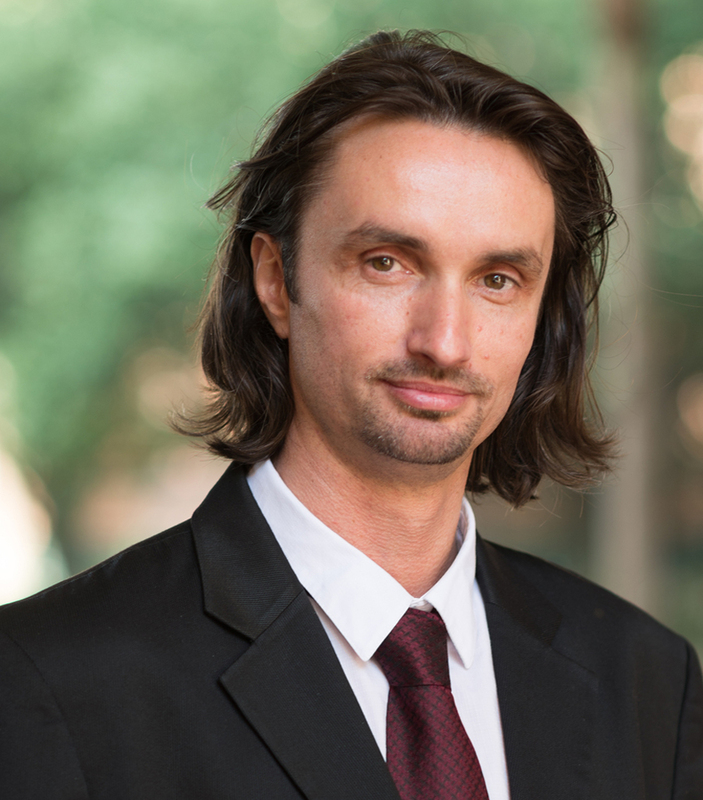 Led by researchers Oliver Grundmann of the UF College of Pharmacy and Saunjoo “Sunny” Yoon of the UF College of Nursing, the study was published in the European Journal of Integrative Medicine, which highlighted it as the “Editor’s Choice” in its August issue. A new defense against prostate cancer, the most common cancer in men in the United States, may come from a seaweed found off the coast of Florida. University of Florida pharmacy researchers have screened various seaweeds with cancer-preventive potential and identified one that shows particular promise. They isolated specific compounds in this common green alga, known as sea lettuce, and undertook studies to understand exactly how they work. Their findings, published Sept. 4, in Cancer Prevention Research, show how the species may protect multiple organs from disease and may be particularly effective in preventing prostate cancer. View UF Health News Video. Sea lettuce is commonly consumed in Asian countries where the risk of prostate cancer is low, but there have been no rigorous studies to verify the correlation, said Hendrik Luesch, Ph.D., an associate professor of medicinal chemistry in the UF College of Pharmacy, a part of UF Health. Luesch’s marine natural products laboratory offers the first investigation of this seaweed’s cellular functions, revealing specific mechanisms that contribute to its anti-inflammatory and antitumor properties and identifying its active chemical ingredients. Scientists have long believed that seaweeds, a staple of Asian diets, may lower cancer risk in Western populations. When Luesch investigated at the molecular level, he identified key factors that support the hypothesis, including which seaweeds might provide the most protection. Close to 240,000 men will be diagnosed with prostate cancer in the United States this year, leading all cancers in the number of new cases, according to a 2013 report from the American Cancer Society. The report shows prostate cancer to be the second leading cause of death after lung cancer for men and ranks Florida second only to California in its estimation of new cases and of deaths this year. Molecules known as free radicals are a byproduct of exposure to environmental toxins and even occur during digestion. They damage cells, causing oxidation and inflammation that lead to a number of chronic health conditions such as heart disease, cancer and arthritis, Luesch said. Antioxidant-rich fruits and vegetables protect the body against these free radicals, mostly through a scavenging process of elimination. Rather than simply removing the damaging free radicals through this direct reaction, compounds in sea lettuce worked through an indirect mechanism, Luesch found. This process increases the levels of a suite of antioxidant enzymes and boosts antioxidants in cells, producing longer-lasting protection. Regulated by stretches of DNA called antioxidant response elements, the enzymes prevent oxidative damage and inflammation. Luesch points to sulforaphane, a chemical in broccoli, as an example of a cancer-preventive natural product that has been shown to work through this kind of regulation. His paper describes how increased expression of these enzymes correlates with an increased antioxidant status of the cell and anti-inflammatory activity. With research funding, further studies can pinpoint potency, dosage and effectiveness, Luesch said. The antioxidant enzyme activities in sea lettuce make it ideal for development as a preventive natural supplement. He sees potential for making a big difference, not only for men’s health, but also to prevent an array of inflammatory diseases that challenge everyone’s health. Luesch is also an affiliate member of the UF Health Cancer Center, the Evelyn F. & William L. McKnight Brain Institute and the Center for Translational Research in Neurodegenerative Disease at the University of Florida. The American Distance Education Consortium has appointed Ian Tebbett, Ph.D., director of the University of Florida online forensic science master’s program, as its new president and CEO. Tebbett, whose leadership appointment began July 1, has served on ADEC’s board of directors since 2009. The UF forensic program won ADEC’s Award for Excellence in Distance Education in 2006. Four years later, Tebbett was recognized by the U.S. Distance Learning Association for his outstanding leadership in the advancement of distance learning through online technology. In 2011, he received the Irving Award, ADEC’s highest honor for innovators within distance education. The consortium of U.S. state universities and land-grant colleges seeking to provide high-quality, economical distance education programs was established in 1994 by Poley, a professor emeritus at the University of Nebraska-Lincoln. A professor of toxicology, Tebbett established the first online Master of Pharmaceutical Science program at the UF College of Pharmacy in 2000. The program was developed for forensic lab scientists seeking advanced education and scientific knowledge for career advancement. The online forensic science master’s program, which has expanded its international collaborative partnerships, has graduated more than 1,000 students from 33 countries and offers five areas of specialization. Because of the success and demand for the forensic science programs he established in the college, 15 more online graduate and professional programs in a variety of pharmacy fields have since been developed at UF. Tebbett is also the director of the UF pharmaceutical chemistry program and a professor of veterinary medicine in the UF College of Veterinary Medicine. He has previously held faculty positions at the University of Strathclyde in Scotland and the University of Illinois at Chicago. Throughout his academic career, Tebbett has worked as a consultant for many international law enforcement agencies, and his research has been widely recognized within the field of forensic science. The University of Florida College of Pharmacy is offering relevant pharmacy electives to student pharmacists at any institution who want to get ahead this summer. Accepted by many top pharmacy schools nationally, UF has six Pharm.D. electives for students to choose from. Taught entirely online, these UF College of Pharmacy electives provide students an opportunity to work ahead and to gain knowledge in an area they may wish to learn more about. To learn more about the curriculum or admission requirements, click here. A distinguished professor emeritus of medicinal chemistry at the University of Florida College of Pharmacy has been named a Charter Fellow of the National Academy of Inventors. Raymond J. Bergeron, Ph.D., who was a Duckworth eminent scholar of drug development, was recognized in February along with four of his colleagues from UF. Nominated for his outstanding contributions in patents and licensing, innovative discovery and technology, Bergeron was among 101 innovators from 56 research universities and nonprofit research institutes. U.S. Commissioner for Patents Margaret Focarino, from the United States Patent and Trademark Office (USPTO), led the induction of the charter fellows at the second annual meeting of the National Academy of Inventors, held at the University of South Florida in Tampa. Bergeron, who holds 200 patents, has published 200 papers, authored a text on bioorganic chemistry, and edited two books on iron overload diseases. His research interests include cancer chemotherapy, the role of metals in diseases and metal chelators. Bergeron has dedicated his career to drug discovery and development surrounding cancer and iron overload diseases affecting children, namely thalassemia and sickle cell disease. As a researcher in the department of medicinal chemistry for more than 30 years, Bergeron established his expertise in cellular function and iron metabolism, leading to the development of anticancer drugs and treatments for children with iron overload disease. He has taken five drugs to clinical trials, including one that shows a promising treatment for children with iron overload. He also has discovered a new therapeutic for pancreatic cancer, for which there is virtually no effective cure. It is anticipated that human trials will be launched within a year and a half. The UF Office of Technology and Licensing has worked with Bergeron for more than 25 years to patent and license his discoveries. As a group, the new fellows hold more than 3,200 U.S. patents. The charter class included eight Nobel Laureates, two fellows of the Royal Society, 12 presidents of research universities and nonprofit research institutes, 50 members of the National Academies (National Academy of Sciences, National Academy of Engineering and the Institute of Medicine), 11 inductees of the National Inventors Hall of Fame, three recipients of the National Medal of Technology and Innovation, four recipients of the National Medal of Science, and 29 American Association for the Advancement of Science fellows, among other major awards and distinctions. A plaque naming the new fellows and their institutions will be on display at the USPTO federal building in Alexandria, Va.
Pharmacy researchers at the University of Florida have isolated a new marine compound they believe may lead to improved drug therapies for pulmonary diseases by inhibiting their progression rather than managing their symptoms. Known as symplostatin 5, the compound was extracted from blue-green algae collected in Cetti Bay, Guam, by Hendrik Luesch, Ph.D., the Frank A. Duckworth eminent scholar chair in drug research and development. The new compound targets an enzyme overactive in chronic obstructive pulmonary disease, asthma, acute respiratory distress syndrome, cystic fibrosis and other diseases. “These compounds can potentially offer a new opportunity to treat COPD and related diseases in a different way and possibly more effectively,” Luesch said. COPD is the fourth leading cause of death in the United States, killing more than 120,000 Americans each year, according to the Centers for Disease Control and Prevention. Current therapies alleviate symptoms of COPD, but do not slow disease progression. Only one drug, Sivelestat, targets the enzyme, called elastase, but its marginal effects are delaying further clinical approvals, Luesch said. Elastase is an enzyme that breaks down a variety of proteins. In COPD, where there is excessive enzyme activity, this contributes in part to lung damage and inflammation. The effects of elastase on these processes contribute to the irreversible destruction of lung tissues typically observed in COPD patients. Lilibeth Salvador, a researcher in Luesch’s Marine Natural Products lab, led the investigation published Feb. 14 in the Journal of Medicinal Chemistry. The study revealed that the blue-green algae prevented elastase-driven changes in bronchial connective tissue cells. She is also presenting the findings at the college’s 26th Annual Research Showcase on Thursday. Salvador, who will earn her doctorate from the UF College of Pharmacy in May, uses a soccer analogy to describe how the compound may prove to be a more effective drug therapy. “By inhibiting this enzyme, we prevent one of the key players in the initiation of COPD. So, we prevent the ball from being relayed on to other players involved in the progression of the disease,” she said. Blue-green algae investigated by the Luesch lab contain naturally occurring molecules essential for survival in a harsh marine environment. These ingredients are what Luesch believes will lead to a new source of drugs that he hopes to develop for improved treatments for patients suffering from COPD and a host of other diseases. From his marine samples collected in the Atlantic side of the Florida Keys to as far away as Guam in the Pacific, Luesch has discovered dozens of new promising compounds. His lab has already chemically synthesized several of these natural products and designed and generated similar compounds with improved drug-like properties. Further research funding enables him to continue the drug development process. His early studies show these marine compounds have the right stuff to begin further clinical studies for drugs to treat colorectal, prostate and metastatic breast cancer, enhance bone regeneration and slow the progression of Alzheimer’s disease. University of Florida pharmacy researchers have modified a toxic chemical produced by tiny marine microbes and successfully deployed it against laboratory models of colon cancer. A promising medicinal compound discovered in a marine organism by University of Florida pharmacy researchers is showing its versatility against multiple diseases. Having already demonstrated its power as an anti-tumor agent, largazole, produced by a cyanobacterium inhabiting coral reefs, has shown a new potential benefit for treating serious fractures, osteoporosis and other bone diseases, according to a study reported this week in the journal ACS Medicinal Chemistry Letters online. A chemical found in everything from antibacterial soaps and lotions to socks may disrupt an enzyme that plays an important role in pregnancy, University of Florida researchers say. Thought to be harmless, triclosan gives many soaps and lotions their antibacterial oomph and is found in hundreds of popular products. But a team of UF researchers led by Margaret O. James, Ph.D., has discovered that the chemical hinders an enzyme linked to the metabolism of estrogen. The researchers’ findings are reported in the November print issue of the journal Environment International. In pregnancy, this enzyme, called estrogen sulfotransferase, helps metabolize estrogen and move it through the placenta into the developing fetus. There, the estrogen plays a crucial role in brain development and the regulation of genes. “We suspect that makes this substance dangerous in pregnancy if enough of the triclosan gets through to the placenta to affect the enzyme,” said James, a professor and chairwoman of medicinal chemistry in the UF College of Pharmacy. “We know for sure it is a very potent inhibitor. What we don’t know is the kinds of levels you would have to be exposed to to see a negative effect. In pregnancy, the placenta basically serves as a developing baby’s in-womb survival kit. Almost everything the fetus gets from its mother — namely food and oxygen — comes through the placenta. It also creates important hormones, such as progesterone and estrogen. Aside from the role it plays in the fetus, estrogen also affects how much oxygen the baby gets from the mother, said Charles Wood, Ph.D., a professor and chairman of physiology and functional genomics in the UF College of Medicine and a co-author of the study. All of the oxygen a baby gets from its mother flows through the mother’s uterine artery. Without enough estrogen, this artery can constrict, decreasing blood flow. “If you don’t make enough estrogen you can, we think, starve the baby of enough oxygen,” Wood said. Estrogen is also involved in signaling the uterus to contract during labor. But maintaining the right levels of the hormone during pregnancy is a delicate balance, Wood says. Too much estrogen could send the mother’s body into premature labor. Too little could hinder the flow of oxygen. Both instances could affect how the baby’s brain develops. This is one of the reasons scientists are concerned about the pregnancy-related effects of chemicals such as triclosan. “Some of these (chemicals) can go and combine with estrogen receptors and mimic estrogen or keep estrogen off its receptors or change the metabolism of estrogen, which is what we are looking at with triclosan,” Wood said. In April 2010, the Food and Drug Administration decided to take a closer look at triclosan after several studies found links to problems with hormone regulation and other possible negative health effects. Other studies have shown that the chemical, which cannot be broken down by bacteria, stays in the environment long after it is used. More studies are needed before researchers can conclude what effects triclosan really has on human health, James said. 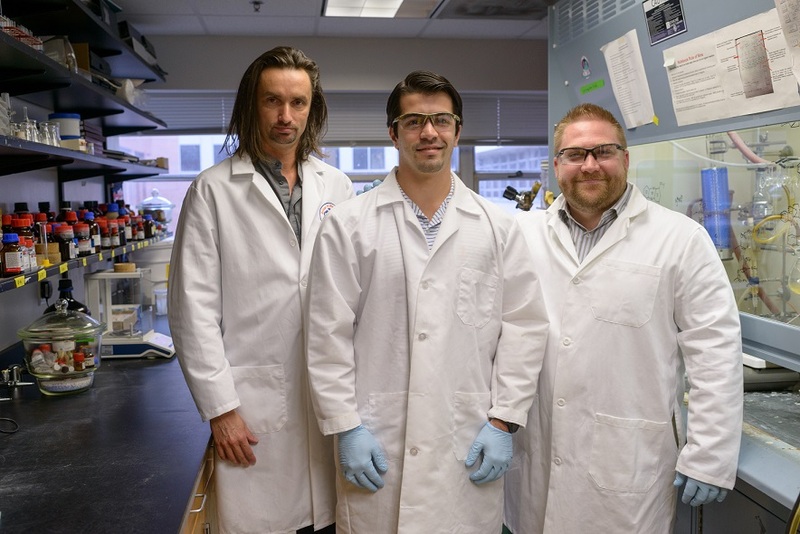 A chemical compound made from a type of bacteria discovered in the Florida Keys by a University of Florida pharmacy researcher has shown effectiveness in fighting colon cancer in preclinical experiments. Writing online in the Journal of Pharmacology and Experimental Therapeutics, scientists say the compound — known as largazole because it was first found near Key Largo — inhibits human cancer cell growth in cultures and rodent models by attacking a class of enzymes involved in the packaging and structure of DNA. More study is needed, but scientists hope that the discovery will lead to new treatments for the roughly 50,000 people struck with colorectal cancer each year in the United States. Researchers are enthusiastic because in addition to having the marine bacteria as a natural source of the chemical, they have been able to synthetically produce the active chemical compound extracted from the bacteria. In a race against time, University of Florida marine researchers are hurrying to collect underwater marine algae samples in the Florida Keys while an ever-growing Gulf oil spill steadily migrates toward Florida, already reaching the Emerald Coast in the Panhandle. Hendrik Luesch collaborating with researchers at Harvard and Scripps, published his findings. Researchers from the University of Florida have discovered a molecule that may help enhance our body’s natural antioxidant self-healing powers without the help of vitamins. This discovery could potentially help people stay healthy and disease free. 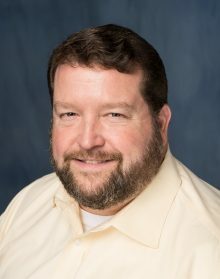 As the University of Florida Forensic Science master’s program reaches its 10th year, its director is being recognized for his leadership in advancing distance learning through online technology in higher education.